Phil Gunder, left, Grace Jackson, center, and Arnold, right, “hyped” fans during their volunteer trip to the Super Bowl. 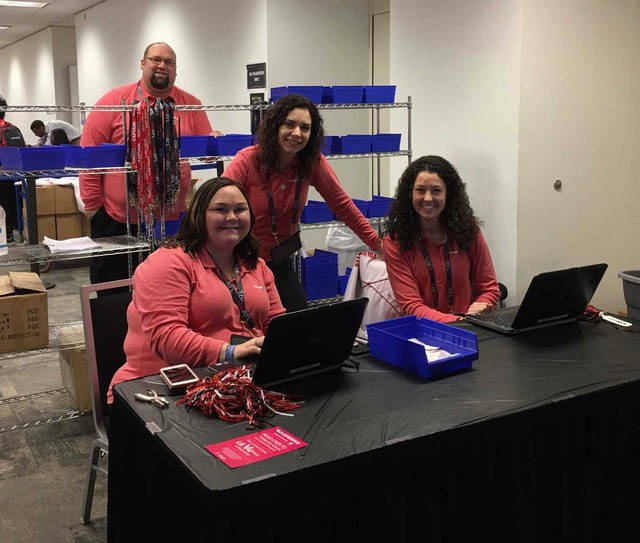 Julia Etzkorn, left, Kara Timmons, center, Aubrey Brunst, right, and Adam Smith, in the back, all UNOH students, volunteered in Atlanta, Georgia, gaining behind-the-scenes access to the ins and outs of the Super Bowl. From left to right, UNOH students Mackenzie Watson, Adam Smith, Kara Timmons, Craig Mell, Yasmeen Mack, Sydney Morrell, Julia Etzkorn, Arnold, Grace Jackson, Phil Gunder and Aubrey Brunst. All nine students worked as volunteers for Super Bowl Live in Atlanta, Georgia. SIDNEY— A Sidney resident received an “up close” view of what happens behind the scenes at the Super Bowl. Austin Arnold, son of Jason and Sherry Arnold, of Sidney, and eight of his classmates at University of Northwestern Ohio (UNOH) volunteered to work at the event. The students traveled to Atlanta, Georgia, and spent four days at the event. All nine students worked as volunteers for Super Bowl Live, which is essentially a fan village. In addition to Arnold, Craig Mell, of Lima, Yasmeen Mack, of Lansing, Michigan, Sydney Morrell, of Lansing, Michigan, Kara Timmons, of Hagerstown, Maryland, Aubrey Brunst, of Harrison, MacKenzie Watson, of Batavia, Grace Jackson, of Louisville, Ohio, and Adam Smith, of Delphos, volunteered for the event. Professors Julia Etzkorn and Phil Gunder accompanied the students. The students in the program were asked if they would like to volunteer for the event this year, he said. “I thought this would be a great experience,” said Arnold. The school provided transportation for the students to go to the event, he said. They stayed together at a house in Atlanta. Each day they would take the train into the city where they began their volunteer efforts. Their first day in Atlanta, the students checked in and received their uniforms for the next three days. “Later, I worked a shift at the Olympic Village,” said Arnold. “There were conference events going on there. ESPN and Tostitos had events there. I was able to see Baker Mayfield there. On Friday, they returned back to the headquarters and handed out uniforms to other volunteers. “We also gave out hand warmers, maps and schedules to the fans,” said Arnold. Friday evening there were concerts fro the fans to attend. Arnold said they were able to see the College Football Hall of Fame, where a private party was being held for football stars and other entertainers. He was able to see Kevin Hart, Jerome Bettis, Urban Meyer and Jim Brown. “They had a red carpet set up for everyone to walk into the hall of fame,” said Arnold. 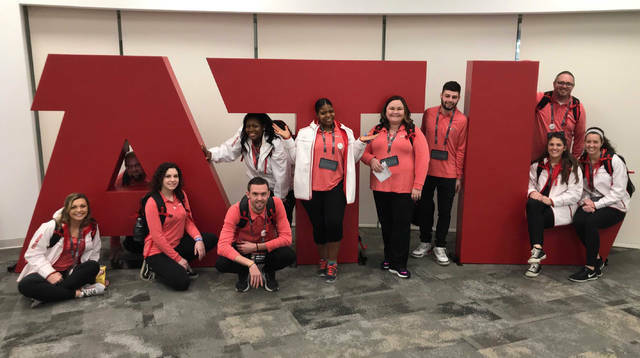 Sunday evening, while everyone else was at the Super Bowl, the UNOH students were back in the house they were staying at, watching the game on television. Arnold said he attended the Super Bowl as a fan when it was held in Indianapolis in 2012. With his volunteer work this year, he’s been able to see both sides of the event. With graduation just around the corner, Arnold is looking to the future. This summer he’ll work with the Dayton Dragons in their VIP Guest Services.After that, the sky’s the limit for Arnold as he puts his experiences at the Super Bowl to work in his chosen field.